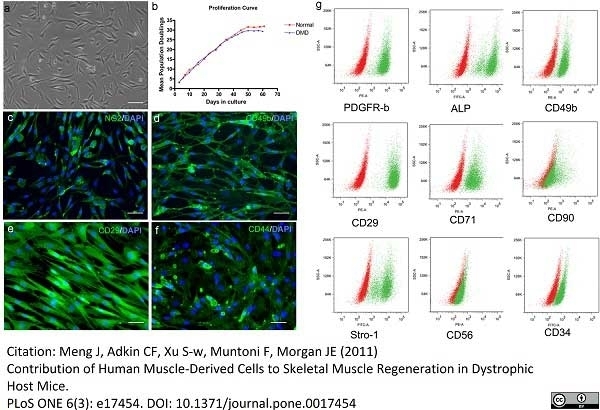 Mouse anti Human CD140b antibody, clone PR7212 (7460-3104) used to evaluate PDGFRβ expression on human muscle-derived stem cells in vitro by flow cytometry. Characterization and phenotype of human mdcs. 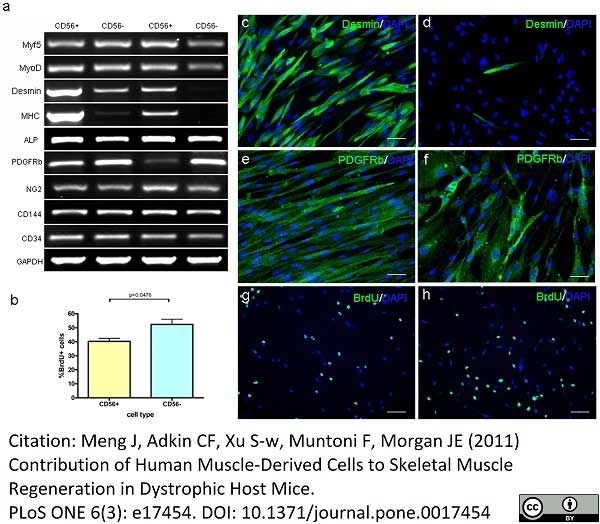 Contribution of Human Muscle-Derived Cells to Skeletal Muscle Regeneration in Dystrophic Host Mice. 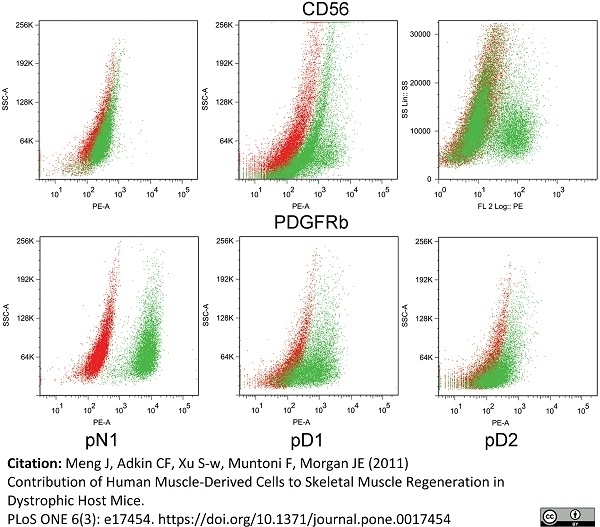 Phenotypic differences between CD56+ and CD56− cells. a. Expression of MRFs and other relevant markers at the RNA level in 2 batches of total RNAs extracted from 2 separate sorts of CD56+ and CD56− cells. b. Graph showing BrdU incorporation in CD56+ and CD56- cells. c, d. Expression of desmin (green) in CD56+ (d) and CD56− (e) cells. Nuclei were counterstained with 10 μg/ml DAPI (blue). Scale bar = 50 μm. e, f. Expression of PDGFRβ (green) in CD56+ (f) and CD56− (g) cells. Nuclei were counterstained with 10 µg/ml DAPI (blue). Scale bar = 50 μm. g, h. Expression of BrdU (green) in CD56+ (h) and CD56− (i) cells. Nuclei were counterstained with 10 μg/ml DAPI (blue). Quantification of BrdU+ cells in each population was compared with Student's t test (b). Scale bar = 100 μm. Expression of PDGFRβ (green) and CD56 (green) in 3 human mdc preparations (pN1, pD1 and pD2) by flow cytometric analysis. Control was performed using corresponding isotype control detailed in Table S1 (red). Note the expression level of these cell markers were highly variable among cell preparations. Mouse anti Human CD140b antibody, clone PR7212 recognizes the extracellular domain of the human PDGF receptor beta subunit. This was confirmed in binding studies using several different cell lines and by its ability to immunoprecipitate PDGF receptor beta complexed with 125I-PDGF-BB (Hart et al. 1987). Mouse anti Human CD140b antibody, clone PR7212 does not recognize PDGF receptor alpha. PDGF receptor beta is a member of the class III receptor tyrosine kinase family that also includes M-CSF receptor, SCF receptor and Flt-3. Binding of PDGF-BB induces receptor homodimerization or heterodimerization with PDGF receptor alpha. Human skin fibroblast cell membrane extracts. Hart, C.E. et al. (1987) Synthesis, phosphorylation, and degradation of multiple forms of the platelet-derived growth factor receptor studied using a monoclonal antibody. J Biol Chem. 262: 10780-5. Hart, C.E. et al. (1988) Two classes of PDGF receptor recognize different isoforms of PDGF. Franklin, W.A. et al. (1990) In situ distribution of the beta-subunit of platelet-derived growth factor receptor in nonneoplastic tissue and in soft tissue tumors. Seifert, R.A. et al. (1989) Two different subunits associate to create isoform-specific platelet-derived growth factor receptors. J Biol Chem. 264: 8771-8. Krane, J.F. et al. (1991) Increased dermal expression of platelet-derived growth factor receptors in growth-activated skin wounds and psoriasis. J Invest Dermatol. 96: 983-6. Palman, C. et al. (1992) Platelet-derived growth factor receptor (beta-subunit) immunoreactivity in soft tissue tumors. Ascoli, V. et al. (1995) Platelet-derived growth factor receptor immunoreactivity in mesothelioma and nonneoplastic mesothelial cells in serous effusions. Gilbertson, D.G. et al. (2001) Platelet-derived growth factor C (PDGF-C), a novel growth factor that binds to PDGF alpha and beta receptor. J Biol Chem. 276: 27406-14. Wang, J. et al. (1994) Cell proliferation in human soft tissue tumors correlates with platelet-derived growth factor B chain expression: an immunohistochemical and in situ hybridization study.